Long time no speak. I'm not afraid to say that I've lost a bit of my blogging mojo, but I have been on such a blogging mission the past few months that I feel that I've burnt out a little. After a busy week in the marketing office, as well as lots of travel I tend to only really have Saturday or part of a Saturday to myself. My Sunday's have consisted of 8 hours of shooting blog pictures, editing, writing and promoting... it's almost like a mini job in itself! Of course I love it though, but I think I have just needed some time to myself recently. I've decided to really go easy on social media and my blog and not try to force or over commit myself. I know that I will be back to normal soon, but I'm not one to rush these kinda things! I know one thing that will cheer me up and that's talking about lipsticks. 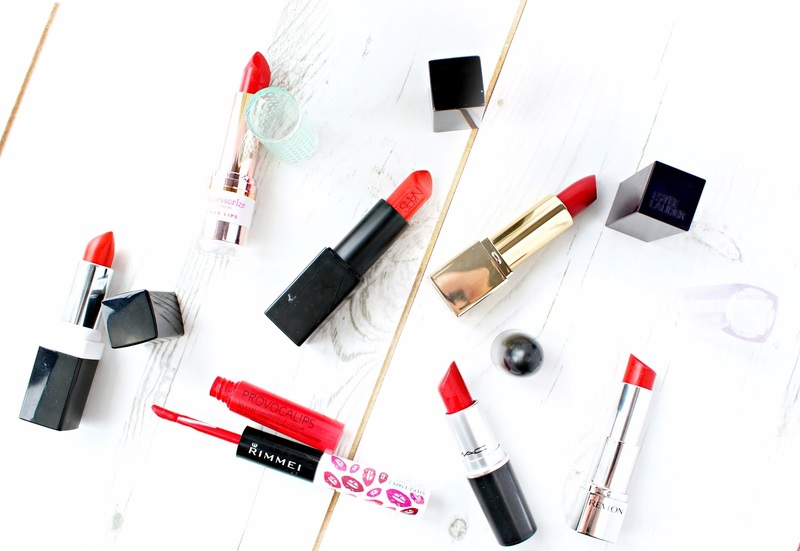 The past two years have seen me become a huge fan of a bold Red lip, instead of intimidating me (like they used too) I now feel so confident when wearing Red lipstick, so I thought I would share a few of my favourites with you today. Aislinn from Lippy In The City very kindly treated me to this gorgeous orangey toned red lipstick from George ASDA, she had mentioned how amazingly moisturising they were as well as having fab staying power for under £5. I really like it and would say it's definitely one of the more moisturising formula's from this selection, and I just can't get over the teeny tiny price for such a great lipstick. Another absolute bargain that has great pigment, great texture and a highly on trend matte finish. Matte Red is definitely more of a cherry toned red, which makes it great for making you're teeth whiter. I opt for this one quite a lot and love how girly and cute the packaging is with a rose gold bullet and a pretty mint polka dot lid. Every time I write about this lipstick I actually feel a little excited inside, It's been my favourite shade and formulation since last Summer, when I first wore it to a wedding. I wasn't expecting to love it, as I had never really ventured into orangey toned reds, but oh my god it was love at first sight. It lasted from 2pm - 2am on the night of the wedding, with just one little touch up! The packaging is sleek, sharp and has a very satisfying magnetic click. I have major love for this lipstick. Scarlet Siren is a deep cool-toned red, which has a bold payoff with a really nice formula too (I believe it contains Apricot Kernal Oil) It does have more of a gloss effect too it, but not glossy enough for it to move around a lot. I have the gift version, but the packaging for the full size is just beautiful. Revlon are renowned for their gorgeous formulations and this lipstick is no exception! It's gel-based formulation ensure that it glides on boldy in one sweep. I would describe it as being a Cherry red and it's definitely one of my favourites out of the lipsticks I've mentioned in this post. This was the first red lipstick I ever purchased and I've had it in my collection ever since! 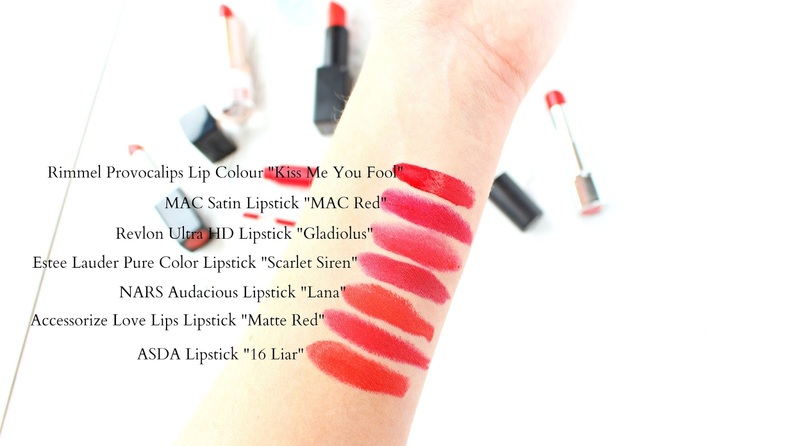 MAC lipsticks are so reliable and to me MAC Red is the perfect Red for anyone venturing into brighter shades. Even though it's a vivid bluish-red it can be toned down to look quite cherry like! It's not the most moisturising lipstick from my collection of red, but it's definitely one my go to's. I love the name of this lipstick, it's pretty cheeky! I have to admit that I find this lip color the hardest to pull off as it's super pigmented and glossy. It does have really good staying power though and the the doefoot applicator makes it easy enough to get a neat finish. It's probably the most in your face red, but none the less it's still a beauty! If I had to recommend one shade it would 100% be the NARS Audacious Lipstick in the shade "Lana" It has been such a transforming shade for me and I truly feel like it lights my face up when I'm wearing it! Everything is great from the texture to the amazing staying power and not to forget the sleek and snappy packaging too! I'm also missing my Charlotte Tilbury lipstick in "So Marilyn" which is also worth a mention! I hope you have enjoyed this post lovelies and I would love to hear from you in the comments section below! What's your favourite Red? Do you find wearing Red empowering or a little scary? The Bette lipstick that I mentioned on Twitter is part of the Audacious collection. They are incredibly creamy, easy to slick on and the snap mechanism is just wonderful when you don't have to worry about it coming loose in your bag. Great post and your pics are gorgeous. I feel the same with regards to blogging at the moment, I don't know why but I have just been feeling a little meh! 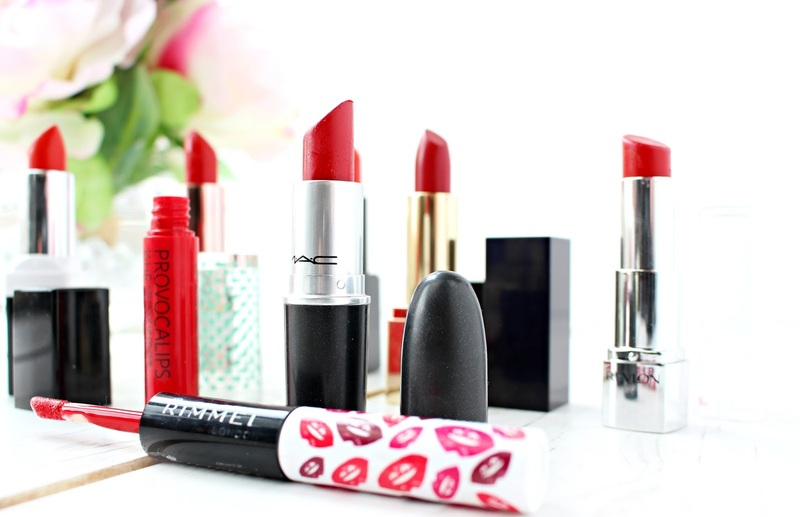 I love Mac Red it's my favourite ever red lipstick and also my first like you!